Opened on July 2, 1927. 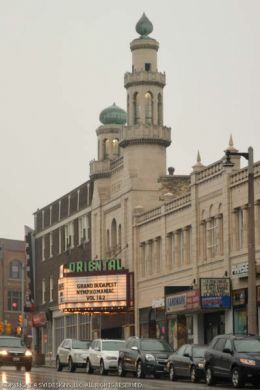 Operated by Landmark Theatres since 1976 under the name Landmark Oriental Theatre. Ownership changed to Milwaukee Film in 2018. Every Friday and Saturday before the 7pm show in the main theatre, the lush sounds of the Kimball Theatre Pipe Organ introduce the movie. This pipe organ is the largest of its kind in a theatre in America, and the third largest in the world. This movie theater is near Milwaukee, Glendale, Shorewood, Whitefish Bay, Wauwatosa, W Milwaukee, West Milwaukee, River Hills, Bay View, Brown Deer, Saint Francis.